From its beginnings in the early 1990s to its present state, enterprise risk management (ERM) has experienced a significant transformation. Over the past three decades, ERM has evolved in response to a number of macroeconomic events, as well as multiple business and regulatory changes. We live in a new world that is now more volatile and uncertain than ever before. The speed of change and the velocity of risk have increased significantly. Download this white paper from ERM pioneer James Lam to learn how organizations can successfully evolve their ERM function. 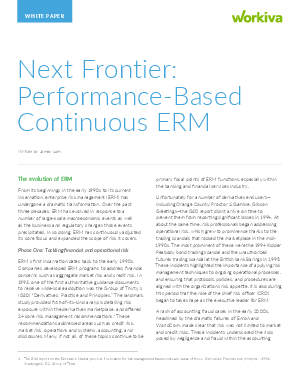 You'll explore the history of ERM and how events have shaped the current function in organizations, the next phase in its evolution of performance-based continuous ERM, and its seven key attributes.